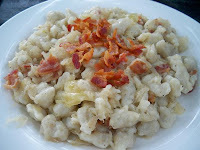 Halusky (Spaetzle) with Sauerkraut - One of my favorite Slovak dishes, I prefer to eat them with "bryndza" or sheep's milk cheese but they ran out. The sauerkraut version was just as good and the spaetzle were bite sized and quite light. They could sometimes feel too bready and heavy but that wasn't the case. Sprinkling this dish with bacon is traditional and while I liked it, it didn't stand a chance next to the thick-cut bacon at Koliba. 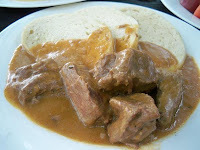 Classic Beef Goulash - This was Matt's choice and I'm so glad that he insisted on it. Served with knedle (bread dumplings), it was incredibly hearty and comforting. I loved how the slow-cooked beef fell apart upon contact--and it was infused with a lovely, pungent beef gravy that seeped into the bread dumplings. Unlike with the halusky, I think that this dish was better done here than in Koliba. Fried Muenster Cheese - Bringing me back to my childhood when my dad made this for us, I simply devoured it. Sure it looked like an ordinary fried cheese block, but it so wasn't. Gooey on the inside, it had perfect consistency and was really enhanced by the side of tangy tartar sauce. If you aren't entirely brave enough to try Slovak food, get this, as it appeals to an American palate. Notorious for bad service, the Beer Garden has turned things around. We didn't have to beg to be served and our food arrived in about 20 minutes. One thing that's slightly disappointing is that the personnel is no longer all Czech/Slovak. 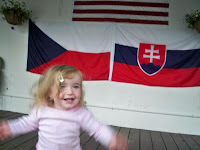 It was nice--and fun--to be able to speak your native tongue there but that's no longer. Oh well. While costs go up each year, it's still a very affordable establishment, setting us back about $76 total for 5 entrees and some sides. Sweet!!! Yet again my friend, we've got our share in common. I too, brave the Bohemian in the rain - and prefer it over the studio square. (a Beer Garden with sushi is interesting and all, but Bohemian rocks for old-school food). Anyhow - we were probably there around the same time - and I had no idea they offered fried Muenster. I often venture for the slippery, garlicky, pierogies. They -pair best with Hoegarten. (However that's spelled)!. Anxious to hear if you've tried BareBurger yet. I haven't tried BareBurger yet but am dying to. Very soon :) Glad that you share my opinion about Bohemian. Halusky look great - haven't had them in ages and would love some. And the cheese is yummy - used to be one of my favorites too! 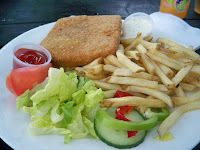 I went there yesterday and had the chicken schnitzel with potato salad - out of this world. The meat was so incredibly moist and the potato salad was very flavorful - tons of veggies and a really nice mayo sauce. I think it had some mustard in it, which gave it tang. Awesome! The portion was very generous too - enough to take home for next day's leftovers. Oh, my beloved Beer Garden. :) I think I like it best in fall, when the crowds have thinned and it's cool enough for platter-sized servings of řízek. Great writeup and photos!